Tim and John shared a meal with Garland this past Thursday. They report he is in good spirits and is receiving lots of help getting around. Give Garland a call or visit him. He's sure to enjoy your visit and attention. Next week, January 22, we will be taking part in the Muhlenberg Library Fund Raiser at Margherita’s Restaurant. Bring your spouses, as each meal purchased supports the library. The following Wednesday, January 30, we will be making what has become our annual trip to the Double Tree Hotel/Santander Arena to watch the Reading Royals battle the Maine Mariners. Please plan to arrive at the Double Tree Parking Garage from Penn Street at 5:45. There will be attendants taking money for Event Parking. Please tell them you are going into the Double Tree, and get a ticket for parking. This ticket can be validated by our wait staff. After a meal at the Double Tree, we will cross Penn Street and spend the evening as the guests of the hotel in their suite right above center ice. Hopefully the home team can be victorious over the Maine Mariners. By the way, their General Manager is former Philadelphia Flyer stalwart, Danny Briere. He has occasionally traveled to Reading with the team, and might be seen in the hallway on the suite level. Tom hopes to collect Prize Bag contributions at our meetings. If you can’t connect at a meeting, give him a call at (610)375-6255 and arrange another connection. Sharon and Tom will be assembling the prize bags the prior weekend. See the downloadable pages for donation suggestions/guidelines. See you on Tuesday, February 26 at the Heim. The Fishing Rodeo date has been set for April 27th. See John Alshefski to find out how you can be of help. The date(s) have been set for Wine and Dine. The event will be held with the Muhlenberg Lions at Jim Deitrich Park on August 17th, with a rain date of August 18th. See Mike, Sean or Tim for details. Get your tickets now, before they’re all gone! Feed back from our neighbors at Riverfest that is encouraging to our club. This Tuesday evening we had our official visit by the new District Governor, Cindy Hornaman. 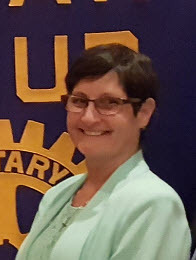 Cindy has been a Rotarian with the Emmaus Club for the past 14 years, and has been active in her club and at the District level, primarily in the Foundation and Group Study Exchange type areas. As a business person, including owning her own business, Cindy brings lots of organization to her position. And the cherry on top is that she is a Nittany Lion! I believe the tone was set early when our board was ready at the Club business pre-meeting. We had answers ready for most areas of inquiry and from a business/administration perspective, we are doing OK. The areas of membership and leadership succession are our areas of greatest need and will deserve and must receive our greatest attention this year. 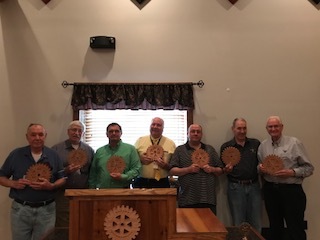 We also gave out our first 2018-2019 insert for Garland Bear’s EREY Rotary wheel. We hope to bestow this measure on all our members this year. So feed the pig, win the drawing, donate through your workplace or just give your donation outright. But earn that insert!!! On Tuesday the 21st we will finalize plans for RiverFest. While it is important to be part of the planning, it is most important to be part of the operation. We will need as much of an effort as members can make to be a vendor for the entire two days. If we all chip in we will make it. National Night Out was proceeding as a real success for Rotary and all the other attendees until…. The rains came! Tim, Allen, Terri, John and Lin had set up shop along with other service groups and vendors. We were well on our way to pulling in a bunch of names and email addresses for our December fruit sale. There was no shortage of people unfamiliar with what Rotary does to listen to our story. But Mother Nature had other plans. Only 20 minutes into the event, the police came around to all the participants and warned every one of the impending thunderstorm. By the time we packed up and carried everything to our vehicles, big drops were beginning to fall. Then things opened up and a serious downpour was upon us. With all that rain and lightning, too, the police made the right call. There was no need to have public risk, even though this was a grand opportunity for Rotary. The lesson learned here, though, is that there are rewards from attending this type of public gathering. We should seriously plan to attend any kind of public event in our area, to educate the public on what we do. If you have ideas for other venues, please bring them to Lin Seyler or Terri Pfennig. Our next event is the joint effort, with the Muhlenberg Lions, at Wine and Dine on Saturday. Help is needed for the set-up on Saturday morning at 7:30 and, of course, at 4:00 to closing (8:00?) for controlling admission and tearing down. 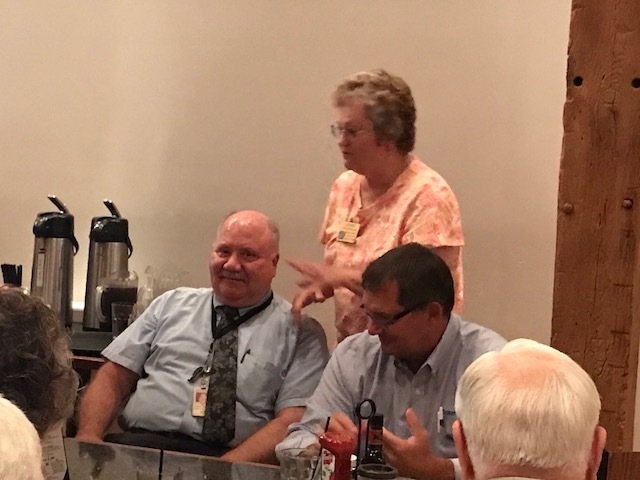 Another most important event is our visit at Blind Hartman’s by the new District Governor, Cindy Hornaman from the Emmaus Club. There will be a business meeting with Cindy, ADG Bob Hobaugh, Officers, directors and Chairs at 5:00 on Tuesday, August 14 prior to our regular meeting. Please plan on attending. You will find Cindy has a lot in mind for Rotary, and having fun while we do it. The Rotary faithful gathered at Crossroads for breakfast Saturday. Six AM isn’t too early for some of us (Sean, Terri, Tom and Lin) We were joined at 7 by Steve, Tim and Mike. It was looking foggy at first, but we persevered. The weather man gave us enough of an opportunity to go out to our interchange and do a cleanup. 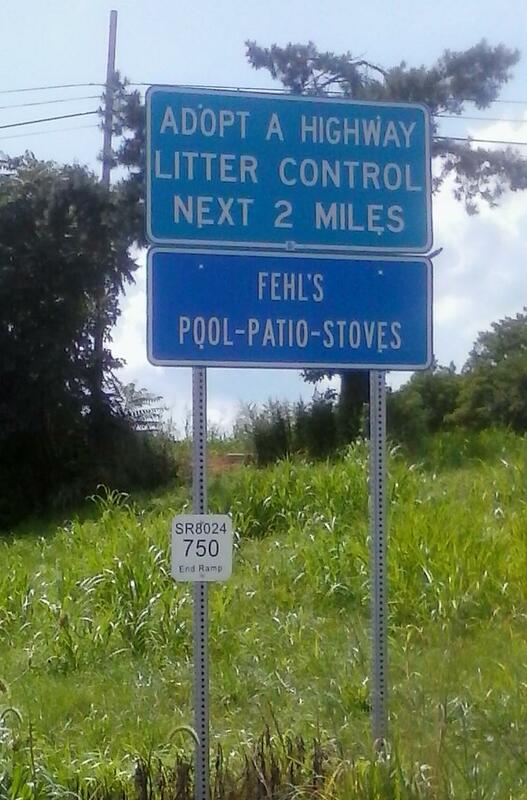 Someone pointed out that there is a sign amidst our area, giving credit to Fehl’s Pools and Patios. Fear not; this is only the starting point for their two miles of the straight and narrow. As can be seen from our sign, posted on one of the clover-leaf turns, we are given full credit for our efforts. It’s hard to believe we’ve been at it for over 25 years. It started up under the leadership of Bill Borda, our recently passed old Rotarian. Ten years under him and another ten under Lin Seyler. Sean is ably following, leading us on to pick-up precision and tenacious trash collection. We’ll have one more opportunity to clean up this year. Sean will be conducting the meeting on Tuesday, as I will be in Ocean City MD at my son’s wedding. Final planning for the Wine and Dine event will be the important business to be conducted. I’m sure we’ll all cooperate and support Tim, Sean and Mike, who do the lion’s share of arrangement for this event. We’ll see you at Jim Deitrich Park for the setup and the event this Saturday. No meeting the following Tuesday, but we all should try to attend the District Governor’s official visit on August 14th. Last evening we had a club assembly, conducting some business to set our club up for the coming year. 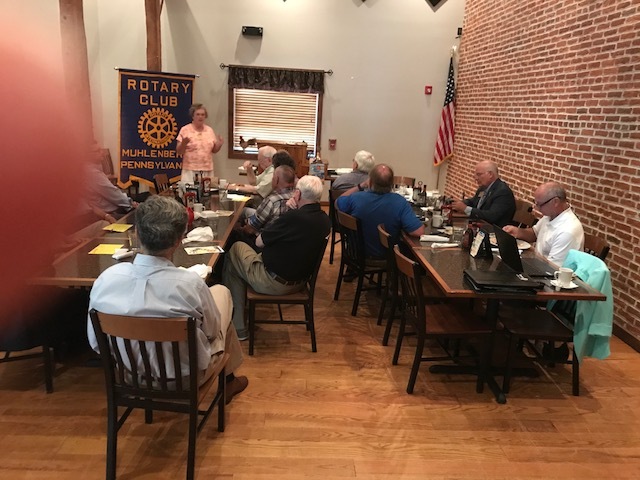 We held a short meeting of the Rotary Club of Muhlenberg Charitable Foundation, electing the President (Lin Seyler) Treasurer (Steve Adams) and Secretary (Terri Pfennig) for the upcoming year. Often we have little business to conduct for the foundation, but on occasion we’ve had to take action on our free standing clock on Kutztown Road. Always best to be prepared. We received a n email from District advising us not to participate in the Philadelphia Phillies Strike Out for Hunger due to unresolved accounting concerns. This is troubling. We also received a very nice card from our Reading-Muhlenberg Vo-Tech scholarship recipient, Stephanie Hemmings. Always gratifying to hear back from those we try to help. We had our first EREY Piggleman drawing of the year, won by John Alshefski. I checked and John was our first winner last year as well. I guess we’ll have to call him Mr. Lucky from now on. 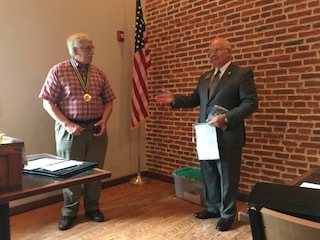 We celebrated Tim Bitting’s anniversary of joining Rotary on June 30th. Also, it will be Tom Kisling’s birthday on July 27th. I heard him say something about providing an ice cream cake for dessert at the July 31st meeting. Speaking of upcoming meetings, we will not be at Blind Hartman’s next week. Instead we will gather on the 28th for 6:00 breakfast at Crossroads Restaurant followed by highway cleanup at 7:00. As this is an outdoor event, watch your email if there is any chance of bad weather. The following Tuesday, July 31st we’ll have the preparatory meeting for Wine and Dine, with details finished off by Sean Fitzgerald, Tim Bitting and Mike Lepera. All hands will be needed for our effort scheduled for August 11th at Jim Deitrich Park. 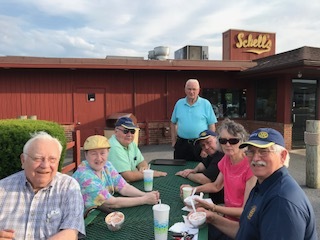 What a wonderful evening for an outing at Schell’s fast food and Mini-golf! My wife Kathy and I were sitting around the entrance to the mini-golf to take attendance and perhaps enjoy some golfing stories. Before he even showed up, there were two women, noticing my Rotary shirt and hat who began inquiring, “Where’s that Garland Bear?” Garland was the first Rotarian showing up to enjoy the evening. One of these ladies did reappear later, to consult Garland on “Library business”. Indeed, he was conducting ticket sales, for those Rotarians he somehow missed selling them at Change-over meeting last week. His first customer was John, freshly returned from the shore, where he was buying ice cream for his grandkids every night. Ask him about it. John was followed closely by Terri and her entourage, including daughter Jess and budding Rotarian, granddaughter Aria. Next to show up was Jack, who is busy dog-sitting for his kids this week. Mike, Linda and granddaughter Emily arrived, although they were waiting until tomorrow to go golfing. Good to see Mike returned from the Delaware shore, after a well deserved rest. Then Tom and Sharon rolled up in Tom’s new pride and joy, his new bright red pickup truck. Last to show was Sean, who visited the lunch counter before sitting down. Both John and Garland started begging French fries from him immediately. I liked his line comparing them unfavorably to the seagulls at the shore. The evening was rounded out when Garland went over to dairy bar and treated all to ice cream, chocolate, of course. All in all it was a wonderful evening helping to celebrate a great fund-raiser for the Muhlenberg Community Library. Schell’s deserves a serious kudos for donating their facility for this event each year. The first order of business was to acknowledge Terri Pfennig for a great year as President. 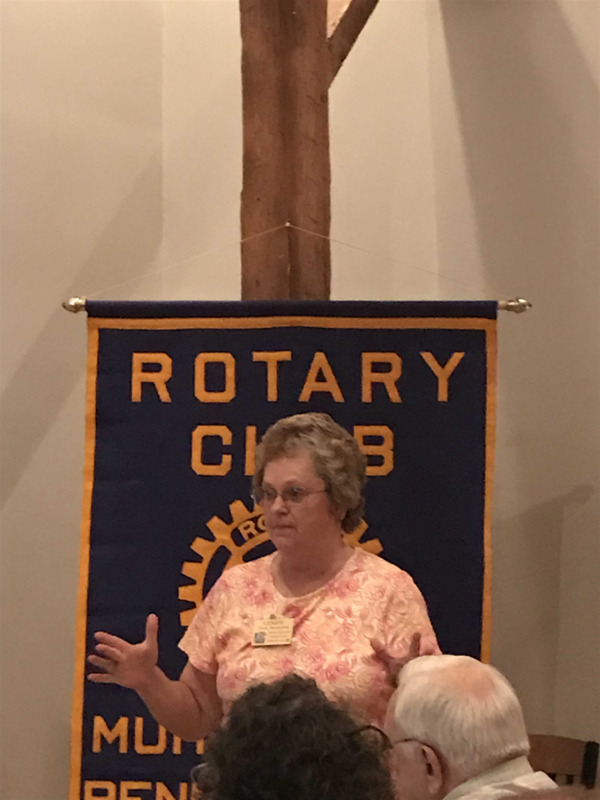 Terri has gone above and beyond to keep up with schedules, coordinate Area events and keep us on track in our Rotary efforts. Throughout her year she could always be counted upon to coordinate our efforts as well as taking care of myriad administrative details. Congratulations on a great year, Terri! We followed up with several announcements, including the upcoming Muhlenberg Library-Schell’s golf event coming next Wednesday, July 11th. We petitioned our own Garland Bear to be the distributer of the twenty tickets the club had purchased to support the event. Being the salesman extraordinaire, Garland immediately proceeded to work the room to sell tickets to members. At the end of several minutes all tickets were sold! President Terri missed out on getting the five tickets that she wanted for her family. I’m sure she can get more from the library. Further action with Garland, the elder statesman of Muhlenberg Rotary, followed. Garland has recently donated the Every Rotarian/Every Year donation to the Rotary Foundation Annual Fund. As a current year donor, he was summoned to the lectern to receive his EREY DONOR wheel, complete with “17-18” insert segment. I wonder who will be the first Rotarian to earn the ’18-19” segment? In line with that, the EREY Piggleman was emptied and there was $60.00 therein. Thus, at our next regular meeting on July 17th we will hold our first EREY $50 matching drawing. Rotarians must be present to win! Normally the highlight of a changeover night is the changeover itself. Not so for this changeover. We were privileged to have Joseph Moyer, a Four Way Test contestant from the Fleetwood Rotary as our guest Speaker. To have a young person expound on the fear of public speaking in the context of our own Four Way Test should awaken all of us to the potential of our youth. If Joseph is emblematic of what can be brought out in our young people, we must strive to be a part of that effort. 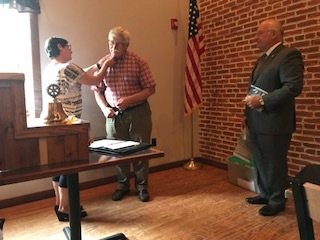 Last order of business was the installation of officers by Assistant District Governor Robert Hobaugh, Jr. We followed with the presentation of the PAST President’s pin to Terri. Terri present the Muhlenberg President’s Medal, mounted in a glass case. This was obtained by our own Fred Hatt at the Atlanta Rotary International Conference last year. The always thoughtful Fred (have you ever received one of his postcards?) also presented a four way test commemorative coin to the new president. Guests in attendance were Bob Hobaugh, Jr., Joseph Moyer and his mom, Jennifer, who became a Fleetwood Rotarian as a result of the Four Way test contest, Kristen York, Terri’s daughter (she is largely responsible for Terri joining our efforts), and Kathy Seyler. Rotarians in attendance were Steve, Garland, Tim, Sean, Fred, Jack, Tom, Allen, Terri and Lin. John and Mike were on vacation. Amy and Sam were unable to attend. See everyone at Schell’s on Wednesday, July 11th (rain date is July 12th). One person’s trash is another person’s rewarding community service? 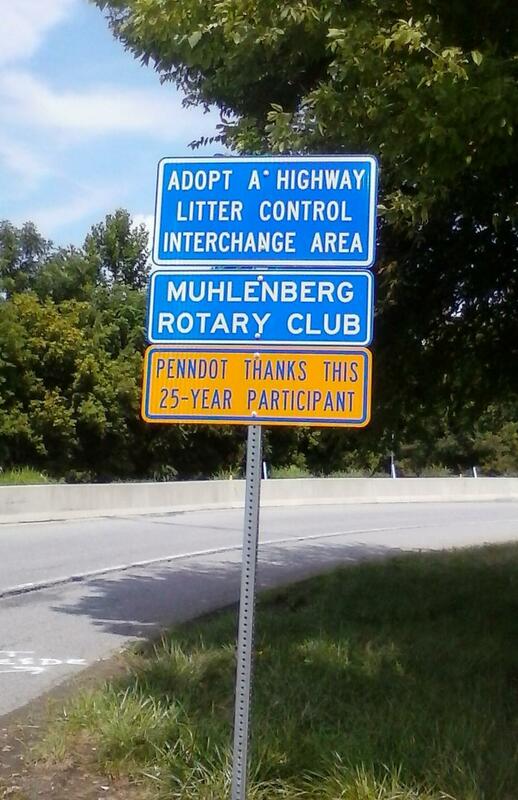 Sound’s silly to say it like that, but Muhlenberg Rotary does find a certain sense of fulfillment and service by meeting several Saturdays each year to patrol and clean up our own little stretch of highway. Meeting earlier (6:00 AM) to have breakfast at the nearby Crossroads Restaurant doesn’t hurt. Good food and better conversation lend themselves to a great start to the day. Saturday it was project leader Sean, President Terri, Allen and Lin to start. After breakfast, with the usual impromptu discussions of other Rotary efforts, we met more Rotarians outside at 7:00. Steve, Tim and Jack were ready to join the cleanup. Also joining us was Terri’s son-in-law’s mom, Sue Skelly. She’s joined us at a number of events; can we get her to take the step of officially joining us? Eight is enough, as the old TV title says. And it’s true for our efforts. With four quadrants to our cloverleaf for picking up, small groups are busy doing pick-up, while employing the “Buddy System” to stay safe. This is always a good idea when playing in high speed traffic! Shortly after we began, some guy in a new red Colorado calls out to us, “Hey where are the bags?” This is Tom Kisling showing up to help. We directed him to where leader Sean is providing bags and safety vests, so Tom can join the pick-up party. All in all, it was a most pleasant morning to be out. Nice temperature and low humidity made the morning walk and stoop a good experience. We’re tentatively scheduling the next effort for July 28th, when we’ll find more trash has appeared. Hope to see you then! Monday is Camp Neidig commencement. It’s always a treat to see a gathering of future leaders. We have no meeting scheduled for this Tuesday, as we have both the highway cleanup and Neidig event instead. The meeting on June 26th at Blind Hartman’s will center on a discussion by Sean, Tim and Mike on the up-coming Wine & Dine event. Next Event/Meeting will start at 6:30 at Crossroads this Saturday, April 7, as we will be having breakfast before doing our first highway cleanup of the year. Also coming up is the joint Lions/Rotarians meeting on May 22nd at Blind Hartman’s. There are 3 entrée choices: Southern Fried Catfish with two sides and cup of soup, Chicken Parm with side salad and Ma’s Meatloaf with two sides and cup of soup. All meals will include non alcoholic drinks. Price will be $20 per person. Please respond to Tim by May17 at tbitting@kochandkoch.com. After discussion, the club opted, by acclaim, for the 5 years option. In the continuing saga of the snow, the Collins’ desires to just avert weather disaster, their neighbors Mike Lepera and Jim Miller, we added yet another chapter at our last meeting. It seems in the untimely and unusually heavy snowstorm recently past (who ever thinks we could get a foot of snow in late March?) Marge and Ed lost their mailbox post to the snow moving efforts of the road crew. Obviously Mrs. Collins was interested in getting their mail and is adamant about having a new mail post installed by Ed asap. Dutiful Ed began the project to correct the situation on a Saturday. He was unable to finish, but assured Marge the project would be completed the following day. The next day he was just finishing cementing in the post when neighbor Mike came over to help. It seemed Ed wasn’t using the right cement, Mike had much better hydraulic cement. So they dug it out and replaced the pole foundation, trued up the pole and all is finished. Mrs. Collins is impressed. Ed wanted to take full credit for the install, but had to admit to Marge that Mike helped him. But all in all, everything is good on Elm Avenue until the next weather calamity. One last word to Ed; think about how things would have turned out had you had the assistance of neighbor Jim Miller. On Monday, March 26th a good Rotarian from the Muhlenberg Rotary, Bill Borda, at 94 years of age, was taken from us to be with the Lord. He was with his family, daughter Terry and son Ray at the end. Bill was a good man, a proud veteran, and a staunch Rotarian. Bill was born on November 14, 1923. He lived in Berks County most of his life; as long as I know him on Marion St in Laureldale. He went to war for his country with the 82nd Airborne in World War II. He was justifiably proud of his service and used to joke that he made 21 take-offs in an airplane before he had a single landing. All the other times before he had to jump! On September 29th, 1951, he married Betty. They celebrated 66 years together this past fall. He spent a career working in the knitting business, working for Dolphin Sportswear as their VP of sales. Bill was always admiring young people’s sports accomplishments, having followed many of them in his work. 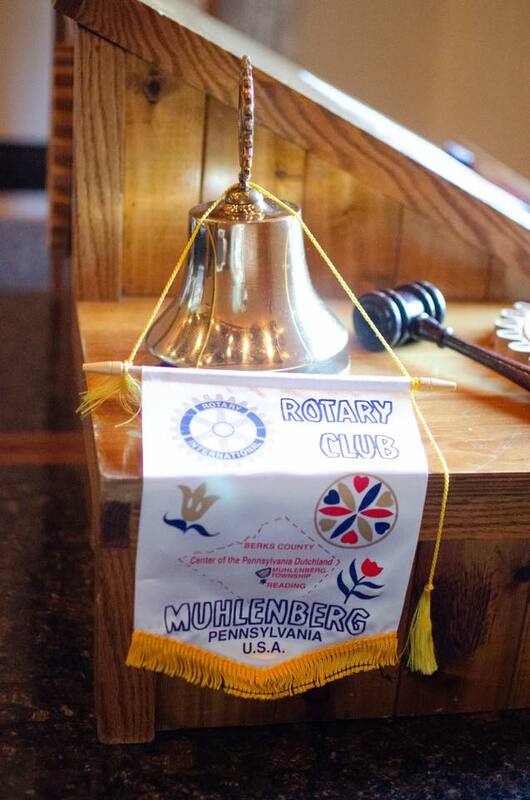 But to many of us, Bill will be most remembered as a mainstay of Muhlenberg Rotary. We list him as entering Muhlenberg Rotary on Jan 1, 1962. This is just the earliest date shown by Rotary International’s records for all older Rotarians. Bill joined the Reading Rotary back in the 1950’s and transferred to Muhlenberg some time later. His dates of service didn’t seem to matter to Bill, just what could he do now. Bill served the club in many offices, as President, as a Director, and Chairing committees. He was always a helping hand at the fruit sale, the fishing rodeo, and other events. But nowhere did he serve better than as the scribe for the club. For decades Bill put out our weekly bulletin, the “Rotamuhl”, with great recounts of our efforts, our speakers and our coming events. And Bill accomplished this without a computer or even a typewriter up until he became an Honorary Rotarian just a few years ago. The club was given the District Award for best publication several years ago; both the club and Bill were proud of this recognition. I have often said that Rotary is like an extended family. We meet so frequently that we become familiar with each other, tease each other, sometimes get on one another’s nerves, but, hopefully always respect each other. Bill was a big part of our Rotary family, a big brother to some, a fatherly figure to others, a friend to everyone, including the families of Rotarians. We all miss him already. Registration is the day of the event. Please register 1/2 hour priory to your age group's scheduled time. 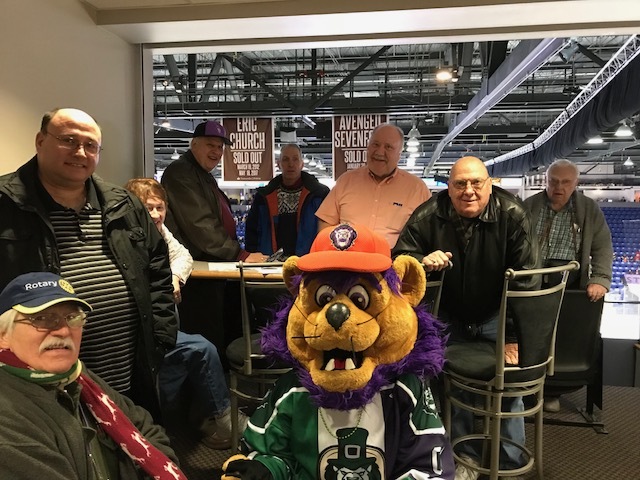 Rotary changed its meeting schedule to enjoy a night at the Reading Royals. After a great meal at the Cheers Restaurant across the street from the Santander Arena, We were the guests of the Doubletree in their suite just above center ice. What a view! After our meal, we crossed the street to enjoy a hockey game between our city’s Royals and the Komets from Ft. Wayne. As an added bonus, the Philadelphia Flyers sent a once prized goalie on rehab to Reading to work the kinks out. In his first game in almost a year, Anthony Stolarz looked a bit rusty, but made some good saves. Also on the ice was Steven Swavely, a Muhlenberg High School graduate. Steve had a pretty assist on a Royals tally. In the suite, we were visited by Slapshot, the Royals mascot posing for group pictures and selfies. He’s always hamming it up, helping all attendees have a great time. During the first intermission, Irish dancers entertained the audience; those little girls were great. But during a third period time-out our box was entertained by President Terri doing the “Y M C A” dance. All this built to the crescendo of OVERTIME! Extra hockey is always exciting. But the Royals fell in the sudden victory stanza. Still a good time was had by Allen Moyer and daughter Lindsay, Tom Kisling and Sharon, Sean Fitzgerald, Steve Adams, Tim Bitting and friend, Garland Bear, President Terri and Greg Pfennig and Lin Seyler. Next week, back to Blind Hartman’s for the usual Tuesday get-to-gether. Celebrating over 60 years of humanitarian service to our community and the world! Is your best friend a Rotarian? Why not? Hold a “Bring Your Best Friend Day” in your club. Set aside a special meeting date each year, maybe twice a year, when your members are asked to bring their best friend to a club meeting.